Not to worry, RR. Politicians making propaganda using the nation's youth goes back many decades. From communists to fascists, and nearly every stripe in between. What we do have are two issues: Speechifyin' to the youth on the theme of "bad press", in combination with the standard-issue crap of "trust everything I say". A politician who claims that is addicted to BS. Contrast that with a politician who tells the youth to "do your own research, use different sources of information". Supposing the same politician claims he can't be right all the time, he's only human, but his party is better than the opposition, etc. etc. That's what a decent politician would say to adults, not adolescents who might miss what amounts to a crass political pitch line. So that is where we stand, a choice between bad and worse. Get ready for the response that places Obama or another Dem prez in the same category as Trump. It won't do much good trying to defend the distinction, even if Obama told the kids in his speech to get their information from different sources. If he also excused his mistakes and pitched his party as better than the opposition, he was edging a little too close to Mussolini, at least regarding the theme of children and politics. Obama refused to ever address the Boy Scouts even though being invited repeatedly. 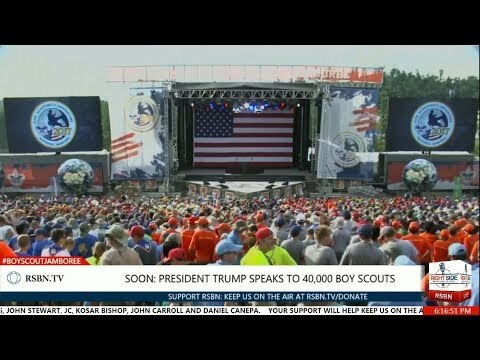 The Boy Scouts seemed quite enthusiastic that Trump showed up and showed them the respect of addressing them. Just another example of the left despising an organization which believes in God and Country, Honor and Service, Integrity and Self Sufficiency. All traits severely lacking on the left and reviled by the left. It would have been nice if Trump had chosen to talk about God country honor country and service instead of pledging loyalty to the Furner and fake news and fake polls and how wonderful he is. Brag brag! A great example for American youth. He even told a story of meeting a guy at a cocktail party. At least he didn't talk about the nice girl he met in a whore house. Next week is another week. How can we expect trump to know what is an appropriate message when talking to young people? He's just learning so let's give him a break LOL. Speaking of booing and Boy Scouts - I suddenly had a flashback from the Al Gore convention in 2000. Yeah, the Dem delegates jeered children. Nice! Part of being a great communicator seems to be knowing your audience, and tailoring your message to fit that audience. I don't mean changing your mind just to give tonight's audience a stroke job; I mean that you can discuss the same thing in front of different groups of people. That has always been a hallmark of success for great orators, as well as great speech writers. Kennedy knew that. Regan knew that. Bill Clinton and Obama both know that. Trump has one speech, it seems. He fills in the blanks with "day of the week"... "city I'm in"... "people I'm talking to"... and then the rest is just a mimeograph of what he he's been saying the past year. Even in Dan's CNN clip that didn't show his more outrageous comments. His message to these future leaders was that Washington is a horrible place yes serve your country by working in this sewer. Such an inspiring positive message. I liked when he instructed the boys on how to get into the girl scout's skirts. I also see the scouts leadership took a lot of blowback for letting trump to hijack their event turning it into another cheap Trump rally. Barack Obama has urged young people to reject pessimism and interact with those who have different beliefs if they want to make changes in the world. Not what Coulter might say to the youth, as she recommends not dealing with lefties. I'm sure not listening to different ideas will always yield positive results. An occasional building collapse and similar failures are a small price to pay for not talking to commies. That was not a CNN clip, it was the entire speech recorded by WhiteHouse.gov. You would rather believe an opinion piece than listen to the actual speech. That explains a lot. Do you think fake news photo shopped the clips moaning about fake news, and calling Washington a cesspool and encouraging the audience to boo Hillary Clinton and the digs about loyalty? Trump expects total loyalty to him not loyalty to the country that was Comey's mistake. Your loyalty no doubt lies with Trump. How does that comment in any way respond to my statement that you would rather read an opinion that listen to the actual speech.